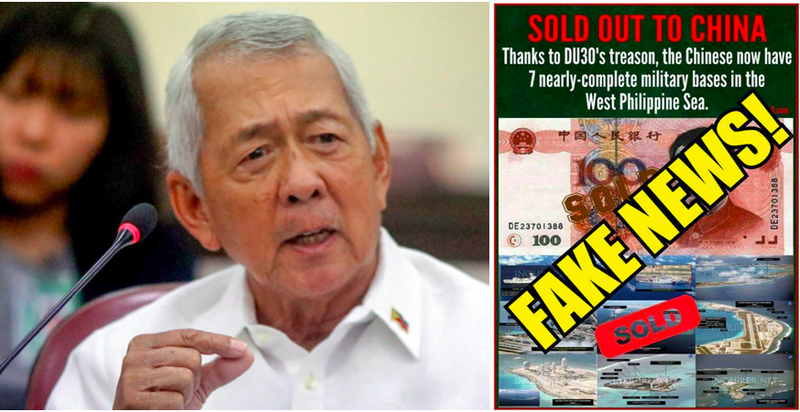 Former Department of Foreign Affairs Secretary, Perfeto Yasay, shared to netizens a piece of information he calls fake news. 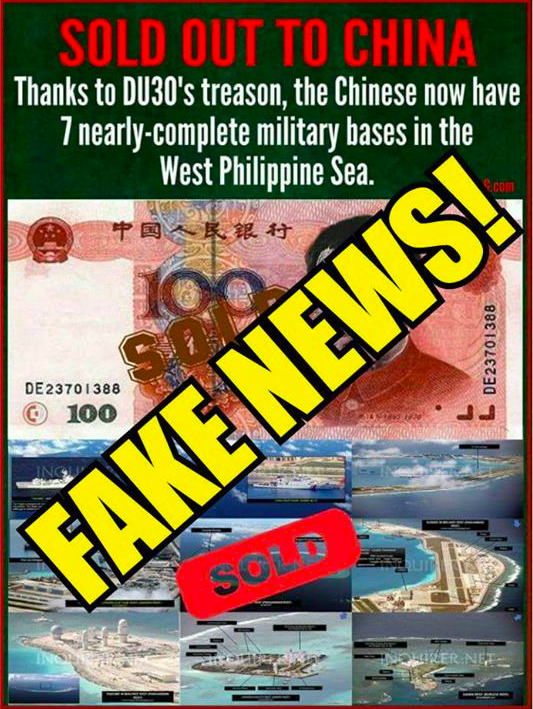 A poster indicating that President Rodrigo Duterte committed treason and sold off the Philippines to China, allowing the Chinese country to have almost 7 complete military bases in the West Philippine Sea, was recently shared to Facebook and Yasay was quick to call this out and call fake news. According to Yasay, the post was clearly black propaganda created to bring more hate towards the Duterte administration. He adds that it can also cause instability, division, and conflict among the Filipino people. All these actions from the opposition, is truly what treason is, says Yasay, and not the actions from Duterte. He adds that China has been creating military bases since even before the term of President Duterte, and the tension between both countries have been increasing and becoming even more unstable. However, it was Duterte that attempted to stabilize the conflict, says Yasay. “It was during the time of P-Noy that China fast tracked its reclamation and construction effort so that by the time PRRD assumed office, these activities were almost completed and nothing could be done to force its dismantling without provoking an all out war,” Yasay said. The United States, an ally of the Philippines did not even do anything, says Yasay. And the continual interference of the country before, only added up to the aggressive expansion of China. It was the Duterte administration that was able to calm China down and allow a friendlier and cooperative partnership between both countries. Ending his post, he advices netizens to be wary and aware and to not be fooled by “these charlatans and their stooges”. I am sharing this black propaganda on my timeline to show how far the opposition and critics of PRRD have gone to propagate a falsehood towards causing instability, division and conflict among our people. They are the ones clearly guilty of treasonous behavior. Long before Mayor Duterte assumed the presidency, around 2002, China began quietly constructing military structures and converting features in the West Philippine Sea into artificial islands in violation of UNCLOS. 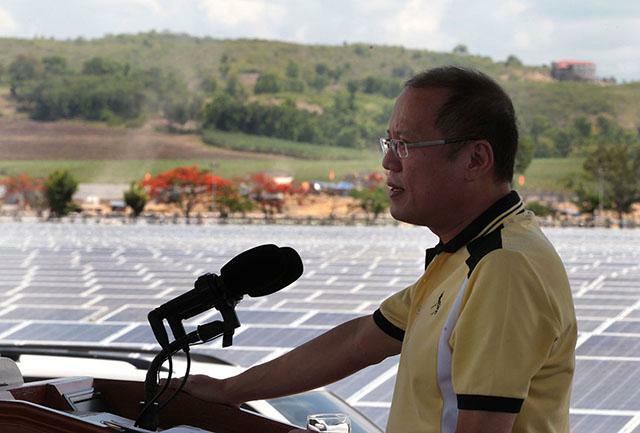 It was during the time of P-Noy that China fast tracked its reclamation and construction effort so that by the time PRRD assumed office, these activities were almost completed and nothing could be done to force its dismantling without provoking an all out war. What President Duterte promptly and wisely did was to ease the heightening tensions and engaged China in a friendly and positive approach that halted the reclamation plan in Panatag Shoal and restored our Filipino fishermen in the area. The U.S. that did nothing to stop, when it could, the construction of these military facilities and independently of any arrangement with the Philippines and purposely to preserve the peace and security in the region, in pursuit of its national interests that converges with ours, have drawn their red line in Panatag Shoal, which arguably halted China's aggressive expansion under its 9-dash line claims. But thanks mainly to President Duterte's initiative, China agreed to desist pursuing its provocative acts against the Philippines in the disputed areas, until such time in the future that we can resolve this delicate issue peacefully, without compromising our territorial sovereignty and eroding our rights under UNCLOS as upheld by the Arbitration Tribunal of the PCA inThe Hague. Do not be fooled by these charlatans and their stooges."